Physical retailers are scrambling to match the growing expectations of consumers who have become accustomed to the benefits of shopping online Sellr® bridges the gap between the physical and digital shopping experience, offering a differentiating value proposition to the key constituents in the retail supply chain. The company’s unique platform provides valuable product information as well as real-time ad execution and tracking. Consumers can quickly access product information like ratings and reviews, with the added feature of narrowing the product set to items within the store. Brand companies can advertise in the aisle to influence purchase decisions at the point of product selection, and retailers can use the platform to cross-sell additional products or upsell to higher margin products. Tablets are mounted in the aisles next to the products, while larger screens are strategically placed to maximize advertising impact. When consumers engage with the tablets, relevant product information is displayed to assist with the purchase decision. There is an option to download content, such as an interesting recipe and a list of required ingredients. During the engagement process, retailers and brand companies can highlight promotions or offer similar products. When the tablets are not engaged by shoppers, brand ads run from a cloud-based service via a dynamic scheduling process. Through advanced geofencing, ads can be targeted to specific demographics as they shop the store. “What makes the Sellr® platform unique is the multi-dimensional value model that serves brand companies, distributors, retailers, and shoppers. No single entity in this supply chain would be able to deliver this value independently,” says Tom Miller, CEO of Sellr® By working together, all of the stakeholders gain the benefits of the enhanced solution. Many companies have attempted to deliver solutions that bridge the gap between physical and digital shopping. Most are either too bespoke–developing highly customized applications that are economically unsustainable, or too generic–simply deploying monitors to run static ad loops. Sellr’s platform provides the right blend of in-store, specific product content while automating brand advertising through deep integration with relevant industry data and media sources. Sellr’s initial core competency is beverages. This category is ideal because it is largely “buy in store, take home,” beverage companies value advertising, and product selection is often complex, leading consumers to seek additional information prior to purchase. The funding model relies on a large amount of installations and advertising revenue, so the target market for expansion are chain stores that can scale quickly and attract the interest of brand companies. Sellr® has partnered with BevTV, a growing digital ad network in the adult beverage industry, to reach shoppers at the point of purchase. 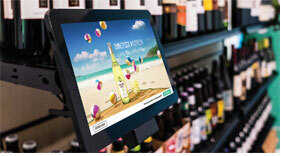 Sellr® is currently conducting a pilot with a major retailer that wants to provide digital assistance to its shoppers. Metrics such as the number of shoppers reached with targeted ads, the amount of direct shopper engagement with the platform, and testimonials from shoppers will be available when the pilot phase ends in Q2, 2019. Sellr® hopes to expand its footprint to cover all the beverage sections throughout this chain, as well as expanding horizontally to cover other categories in the store. Sellr® is in discussions with other retailers to offer similar pilots and expansion plans. With more than four decades of experience in retail and technology, Miller is well positioned to lead Sellr’s strategic advancements and expansions.